Abstract: Asus motherboards based on the i875P Canterwood and i865PE Springdale chipsets were almost immediately available for retail sale upon the chipset release. It's kind of funny that even newbie computer users know the ASUS name, and speak of the "legendary" quality given their limited experience with computers. Name recognition certainly goes a long way in a crowded marketplace, and I'm sure the 'suits' at ASUS cherish it. There's good reason of course why Asus is held in such high regard, even with novice users; the build quality is widely considered reliable (but sometimes bland), and the products perform well, and last. Heck, my dad's old Asus P3V4X is still running to this day! Asus also seem to eke just a bit more performance out of their products than the rest of the crowd, and while you may not notice it in real life situations, it always looks good on the benchmark charts. As with the nForce2 launch, Asus motherboards based on the i875P Canterwood and i865PE Springdale chipsets were almost immediately available for retail sale upon the chipset release. Being at the forefront of a new chipset release is one of the key factors in getting market share - or in other words your hard earned spending money. Today we're going to be testing out Asus' P4C800 Deluxe Intel motherboard - the companies flagship board for the Canterwood chipset. This little bad boy comes with a whole slew of features like; four Serial ATA/Serial ATA RAID headers, a low-profile Ultra/133 IDE channel, 5.1 audio, Gigabit LAN (not CSA) and IEEE 1394 firewire for starters. If that's not good enough for you, you can upgrade the board from any of its five PCI slots and long 8x AGP Pro port. Officially the i875P chipset only supports Northwood B and C processors (533MHz, 800MHz FSB respectively) however according to Asus, you can also run 400 MHz based Northwood Pentium 4 processors in the P4C800-DLX. 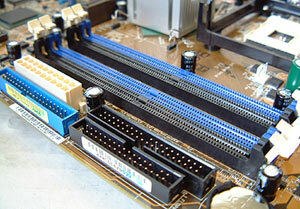 The four DIMM slots can accommodate up to 4GB of PC1600/2100/2700/3200 DDR RAM, ECC or non ECC. Asus has never really been big on flashy or colourful PCB's (other then their Black Pearl line of mobo's), and so we're faced with the standard brown we've come to expect over the year. Rather than blind the consumer with colour, Asus are hoping to attract our attention with quality, features and most importantly, performance. We'll see how the Asus P4C800 actually performs in the benchmarks in just a moment, but first let's have a closer look at the board itself. 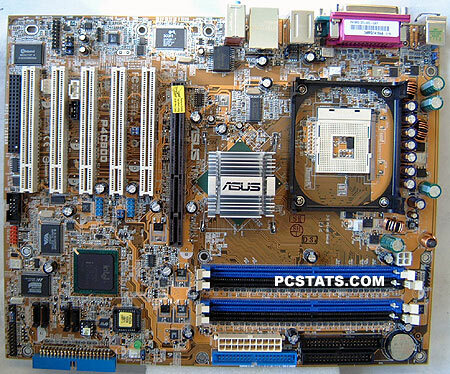 The general layout of the Asus P4C800 motherboard is very good considering the number of items squeezed onto the PCB surface. The main ATX power connector, IDE headers and floppy drive connectors are located in their ideal spot to the right of the DIMM slots. The third IDE channel has been tilted 90 degrees to the right so the cables will not interfere with airflow or other system devices. 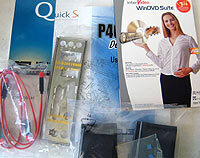 This low-profile mounting can be quite handy when it comes to extra long PCI cards, and clearance. One thing we really liked about the Asus P4C800 was that the manufacturer installed a plastic back plate behind the CPU socket for added support. This back plate help to ensure that the motherboard will not warp, or buckle when a stiff heatsink is attached to the HSRM (Heatsink Retention Mechanism). You might be thinking that this is a pretty minor point to even be discussing, but each of the three fan headers are located in easily accessible positions. How many times have you seen a manufacturer place a fan header below a PCI slot, or next to the ATX power connector where it was almost impossible to reach? Pg 2. Deluxe Motherboard, Deluxe Features?